Taming Volatility: Taking Advantage of a Moody Market? The recent surge of elevated volatility has caught the attention of many investors, particularly those already spooked by the recent tumble in oil prices or anxious about what the Fed may do with rates. However, it’s worth remembering that volatility does not always translate into investment losses. For Financial Literacy Month, April’s Wealth Management Insights looks at strategies investors can take to try to mitigate – or potentially benefit from – the effects of volatility on their portfolio. 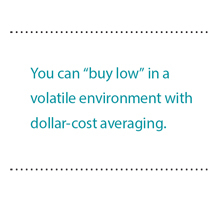 You can “buy low” in a volatile environment with dollar-cost averaging. Dollar-cost averaging is the regular purchase of a fixed dollar amount of an investment, regardless of share price (e.g., $1,000 every month). When the share price goes up, your $1,000 investment buys fewer shares; when it goes down, it buys more. Too often, investors become paralyzed by a volatile market. Dollar-cost averaging can be helpful in removing the emotion from an investment decision by instead creating a regular, consistent savings plan. This strategy is most effective when there are multiple up and down periods – if price movement is flat, there are no share price dips to buy. Dollar-cost averaging cannot protect against loss in a declining market, and is therefore not appropriate for every investor. Certain types of investments are better suited to address volatility. Instead of maturing all at once, bonds in a bond ladder can mature in intervals over several years. If interest rates rise, the investor can use the proceeds of a maturing bond to invest at the higher rate; if rates decline, only a portion of the bond portfolio will be subjected to the lower rate. Alternative investments, such as hedge funds, real estate and private equity, have a low correlation with traditional asset classes and the potential to mitigate a portfolio’s overall volatility. Diversify your portfolio, both among and within asset classes. A broad allocation across unrelated investments and sectors can help minimize the damage of a localized dip. One of the best ways to deal with volatility is to ignore it altogether. Maintaining a long time horizon (over years and decades) allows value investors to pay little mind to short-term market fluctuations. This approach requires investors to do their homework and identify companies with strong fundamentals such as growth over time and consistent earnings. For these companies, periods of volatility could be a buying opportunity, though it’s only a successful strategy if the share price sufficiently rebounds. Although these strategies can be useful in helping investors tame volatility, they’re by no means foolproof: Such approaches can be complex in their own right and carry their own unique risks. Your Baird Financial Advisor can help you determine if these strategies are suitable for your needs and implement them as part of a comprehensive wealth management plan. Robert W. Baird & Co. does not provide tax advice or services.